Here are some of our favorite Utah camping hot spots for you to check out! It’s no secret that Utah has some great places to camp. Whether you’re a fan of the heat of summer or the cold of winter, Utah has something for you. With our location conveniently placed just 15 minutes away from Utah’s International Airport in Salt Lake City, Lost Campers is perfectly positioned to allow you to check out the Beehive State’s most interesting places. These are a five of our favorite Utah camping hot spots that may not be as well known as the Mighty 5 National Parks. 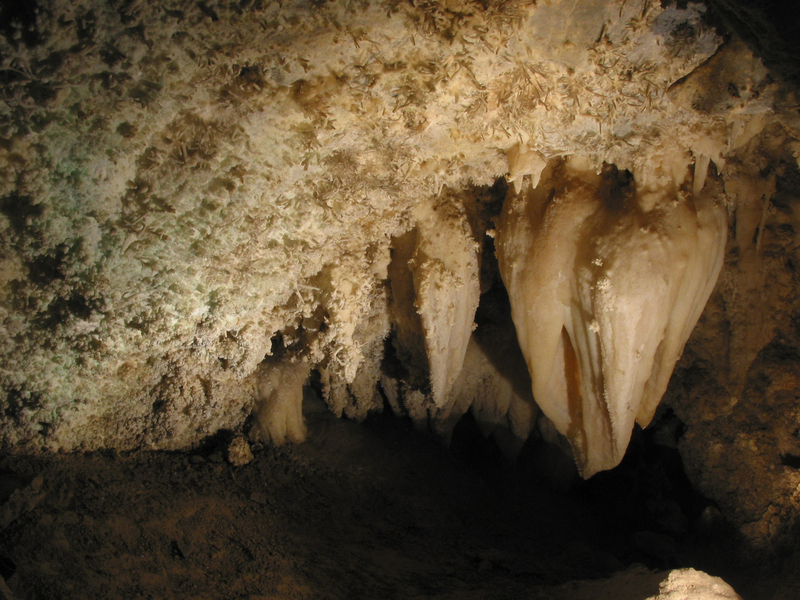 Home to the Timpanogos Caverns, the Timpanogos National Forest is perfect for campers that would like to explore some of the forests that Utah has to offer. If you’re up for the 1.5 mile steep hike up to the cave, it’ll be worth your while. The cave does require that tickets are bought in advance, and the cave tour is only open from May 19th to September 3rd. While the temperatures outside can soar, the cave remains in the 40s (Fahrenheit), so you’ll want to bring along a jacket. The cave isn’t the only thing that Timpanogos National Forest has to offer though, there are other hikes and activities to do as well. If you’re headed down south and you’ve arrived later in the day, Yuba State Park is likely going to be the best place to stop for the night. Yuba is about 2 hours away from our SLC depot, so you don’t have to worry about making a long drive. The State Park has plenty of things to do as well, including hikes, swimming and boating, and in the summertime they even have a zipline! Yuba makes for the perfect pit stop on your way down to southern Utah. 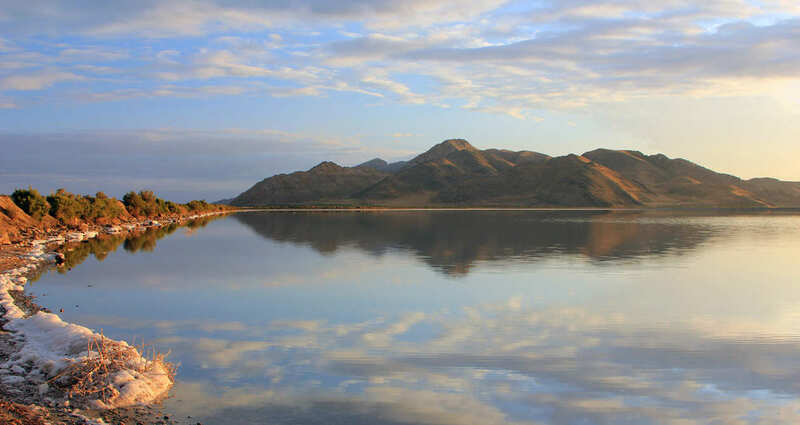 Located on the Great Salt Lake, Antelope Island is only a couple hours away from our SLC depot. Antelope Island is popular for short stays, but there’s plenty of fun things to do. Check out the visitor’s center for information about the local wildlife and to see gorgeous photos from local photographers. There’s also a farm on the island where you can see how the original inhabitants lived as well! Roaming about the island are of course wild antelope, and also buffalo. 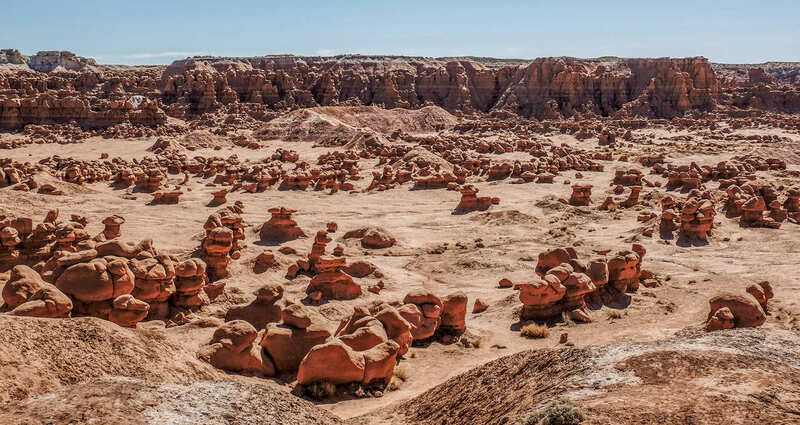 Goblin Valley – A staff pick for Utah Camping Hot Spots! Located a couple hours east of Moab, Goblin Valley State Park has some of the world’s most unique geology. This is definitely a staff pick when it comes to Utah camping hot spots! The “goblins” make the park look more like an alien planet than anything you’d see on earth – in fact, the park has been used to film scenes for sci-fi movies! Goblin Valley also has a great view of the night sky, as there’s very little light pollution. For you stargazers, Goblin Valley could be a great place to stop for a few nights. The first international dark sky park certified by the International Dark-Sky Association. Natural Bridges has plenty of activities to offer during the day, including hikes of varying difficulties. The real special part of this park comes out after dark when the sky is so clear you can see the milky way. 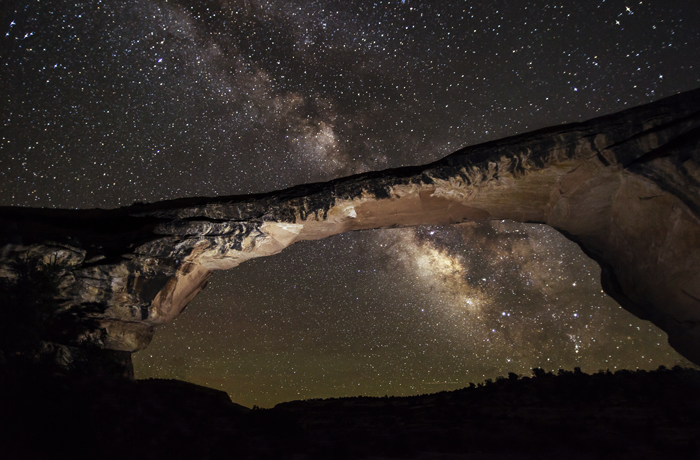 Stay up late and bask in the universe’s glow at Natural Bridges, you won’t regret it. Natural Bridges is definitely a Utah Camping Hot Spot you’ll want to check out while you’re adventuring across the State. 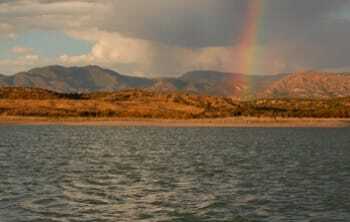 All of these Utah camping hot spots await you! Hop on into one of our low-cost campervans and hit the road. Get your no-obligation free quote today! Our schedule fills up fast, and you don’t want to miss out on the best budget campervan deal the west has to offer. Some awesome reviews from Facebook! Luciano A recommends Lost Campers Budget Campervan Rentals & Hire. We had a great trip with our van! Very convinient car, nice staff, easy to ride & park! We went from LA to SF with no trouble and such wonderfull landscapes. Super vacations ! Zoë C recommends Lost Campers Budget Campervan Rentals & Hire. Easy going company, nice staff, good service and well maintained campervans. They are ‘unmarked’ so you don’t stand out as a tourist, which I think is an advantage over rentals that have the company name written on the cars. Well equipped van. The bed is easy to prepare and pretty comfortable. Overall a very good experience with this company. Courtney M recommends Lost Campers Budget Campervan Rentals & Hire. We picked up our Dodge camper at 3rd st in San Francisco. 3 weeks later we returned it, tired, gloriously happy and our Dodge ‘boots’ was none the wires for wear. After two days in Frisco we headed to Chicko, then next our first night in the redwoods national park. Next night Vancouver Washington with reallies then the long haul back at Baker city, then Layton / Salt Lake City. Next was 3 more Utah days in the wilderness at a friend’s off grid house north of Canab … here we got to go to Zion, Bryce Canyon and experience loads of wonderful things in this high desert. Apart from a hot night we leafy early next day for yosemite staying just outside the park at 6950 feet at lee vining at the monovista park Yosemite included seeing a bear!!! Then via the sequoias at Mariposa we returned for a few more days in SF. Overall lost campers were brilliant – we had to take Ng them twice which was a real comfort for us down under travellers The bedding, cooking gear, car, security comfort were all Aok … driving at Arizona interstate legal speeds of 80MPH and moving from 284ft below sea level at 98degrees f. To the next day at 9945 at Tioga pass entering Yosemite at 36f meant the Dodge was tested to a pretty high level… she never missed a beat! Never ran dry of water or oil, was reasonably economic, always started and was comfortable to drive and sleep in during our 3650 mile adventure. Samii J recommends Lost Campers Budget Campervan Rentals & Hire. Our experience with Lost Campers was so good and incomparable. The price was so much more affordable than other companies and the service was above and beyond. Before we left on our road trip, they threw in so many extra things to make our experience on the road that much better. I’m talking fire wood, extra sleeping bags and an inverter so we could charge all our electricals. The van was modern and reliable and super comfortable to sleep in. We had an amazing time in our little van travelling up the west coast! It became our little home in the great American wilderness. The van was stocked with everything that we needed for a comfortable trip. The van itself was very modern and clean. All the staff were super helpful to deal with throughout our trip, much more attentitive and accessible than hiring from a big company, and at such a great price. Great way to travel throughout America, couldn’t recommend more! We hired a campervan from these guys for a couple of weeks and travelled up the West coast from San Francisco and dropped it off in Seattle. We wanted to travel without drawing too much attention, so the plain white van was exactly what we wanted. The van was in great condition, super comfortable, and had all the extra stuff we needed-cooking gear, chairs, stove etc. This was our 2nd time renting with Lost Campers and I would 100% recommend them. When we received the van it was spotless! All the dishes and bedding were neat and tidy. They even filled up the clean water tank for our sink. They were super accommodating, when we wanted to extend our trip they happily added days to our booking. We even had a few hiccups… I had a run in with a cement curb and they were quick to respond and work with our insurance company to get the issue resolved. I truly appreciated how understanding they were and customer service during that little incident. I’ve rented from other camper van services in the past and this is by far my favourite! Brad G recommends Lost Campers Budget Campervan Rentals & Hire. Picked up Arlo, our Dodge Caravan, in San Francisco and dropped it off 11 days later in LA. The van worked like a charm, as did the bed and tricked-out kitchen in the back. We went from Yosemite, to Big Basin Redwoods, down the coast and onto Joshua Tree. Never worried about the car or where we were going to sleep. Arlo and Lost Campers get an A double-plus. Clémence P recommends Lost Campers Budget Campervan Rentals & Hire. 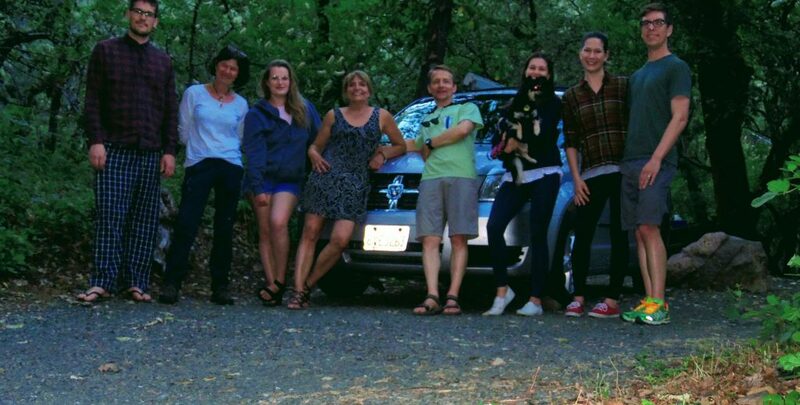 We spend an amazing trip in California with “Paul Car” from Lost Calpets. We had all we need for an unforgettable road trip ! Cedric R recommends Lost Campers Budget Campervan Rentals & Hire. We had a great trip with Lost Campers. Frankyboy (all cars have their own name) took us all the way to arizona and back! the van was really convenient. I would recommend Lost Campers to everyone. Klödia R recommends Lost Campers Budget Campervan Rentals & Hire. Nous avons adoré notre road trip! Nous avons eu un bon service à notre arrivée et au retour de la location. Je recommande sans hésitation! We loved our road trip! We had a good service at our arrival and the return of the rental. I recommend without hesitation! Gina J recommends Lost Campers Budget Campervan Rentals & Hire. We rented “Mr. Cool” in Los Angeles for a 10 day adventure of the West coast and returned in Seattle. The company was very responsive to all of our questions beforehand. The staff in Los Angeles was very friendly and made our after hours return in Seattle a breeze. While this campervan wasn’t as roomy as ones we had rented in the past, we made do and it served all of our purposes. The fact that it rained 8 out of the 10 days didn’t help, and we couldn’t use the canopy because it was so windy. Obviously no fault of Lost Campers, but something to think about if you plan on traveling this way. Awesome customer service and we would not hesitate to rent from them again!! Thanks guys! And now for some super Google reviews! I had a great 5 day adventure in my little minivan “Oliver.” I loved that the van didn’t scream out that I was a rental. It somehow seemed safer as a single woman traveling alone. The customer service was exceptional…they really laid out the landscape and gave me great advice of how to navigate vanlife. Highly recommend! We absolutely loved this company! It was our first time traveling in this kind of van, and we couldn’t have asked for a better experience. The vans are comfortable, safe, warm at night (even in the cold desert) and have great amenities. A huge plus is how discreet the vans look – great for parking in cities, with super tinted windows, not advertising that all your stuff is inside. 🙂 We would definitely recommend this company to anyone wanting to travel with more freedom and ease around the West Coast. 6 stars! Had a wonderful experience with Lost campers. When our van encountered an issue they went far beyond our expectations to rectify it. Very professional and awesome staff! Hope to rent from them again some day. Absolutely LOVE this company! My husband and I used their van to travel up and down the coast of California and it was amazing! So convenient, affordable and comfortable. The people who rented to us were very helpful and flexible. We were made to feel safe and accommodated while renting through them. Excited to rent again! We have rented camper vans from Lost Campers on several occasions. 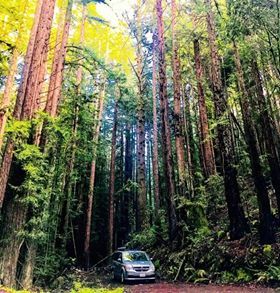 What we love is that they are easy to drive mini vans that can be parked in any camping spot. They are basic, simple to use and everything you need for a camping trip for two; and the price is right  Because we live close to San Francisco, we supplement with some of our own bedding and kitchen equipment, especially coffee making stuff as that isn’t provided with the van. Great team at the office to deal with. We will definitely be back. Maybe next time we’ll do a one way to LA and get the Coast Starlight train back. I had a fantastic experience. I spent a month in one of their converted camper minivans. Great price and excellent customer service over the phone whenever I needed any help. Also I liked how there weren’t any logos or advertisement on the minivan as it’s nice to be a bit more stealth and not advertise the fact that you’re a traveller. Great budget campervan! Cheapest one I found in Utah by far. I basically used it as a place to sleep rather than dealing with setting up tents and finding tent sites at night. The little sink in the back was handy for brushing my teeth but I didn’t use it more than that. We took the van for 5 days and drove to Teton and Yellowstone National parks, and Antelope Island (which is a gem) driving just under 1000 miles return trip. We were really pleased about how smooth the whole Lost Camper hire and return process was, and how friendly and helpful Aspen and Drew were. The Dodge van was kitted out with everything we needed including sink, fresh water and waste containers , tables, bedding (and comfortable bed) chairs, gas cooker, crockery, etc. An added bonus was that we also picked up some essential things that previous campers had returned unused such as maps, bear spray (thankfully re-returned unused!) and laundry soap, etc. A great experience. The only thing that could be improved was information on the LC website about bringing towels. Highly recommended for people wanting an adventure..